The Alliance For Democracy - News, eNewsletters, Alerts and Chapter News: Stamp out big money politics and political bribery! Stamp out big money politics and political bribery! Move to Amend is on a roll this fall! The Amend-O-Matic, a mobile money-stamping machine, will be crossing the country this fall, stopping to imprint your hard-earned currency with a strong call for an end to corporate personhood and political bribery. 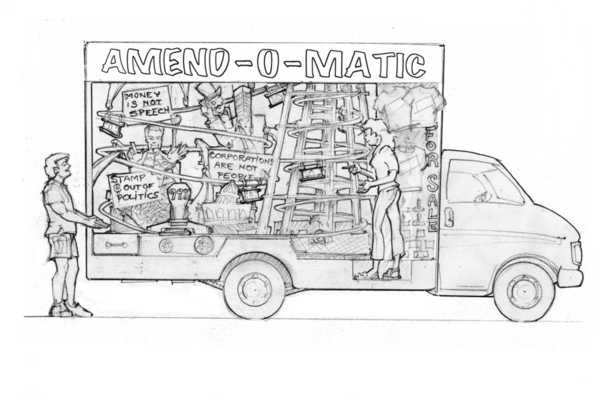 The Amend-O-Matic is part machine and part vehicle--a public art spectacle, information center and money stamping machine. People can insert dollar bills and receive them back imprinted with messages like "Corporations Aren't People. Money Isn't Speech," "Not to Be Used for Bribing Politicians," and "The System Isn't Broken, It's Fixed." When you spend your stamped money, you send the anti-corporate personhood message out through the country. The Stampede to Amend 2012 Tour kicks off on October 11 with a press conference in Los Angeles. 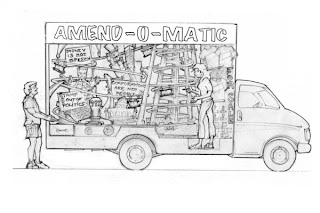 From there, organizers Ashley Sanders and Renae Widdison will drive the “Amend-O-Matic” across the US. You can see the full tour here, but even better, you can help make the tour a success by hosting a stop, and helping to organize a workshop or training on building the anti-corporate personhood movement. Ashley and Renae will be driving the Amend-O-Matic to a new community each day, generally arriving around mid-day in order to spend some time in a public location, like a community park, downtown, farmer’s market, or art walk, operating the vehicle to stamp people’s cash and spreading the word about the workshop that evening. They will also be available at this time for interviews with local media. Each evening workshop starts at 6 and lasts an hour and a half. Ashley and Renae are experienced community organizers and trainers who can help your community respond to the impacts of corporate rule and join the Move to Amend campaign or engage more support for the work you are already doing. Your local Alliance chapter or member network, Move to Amend affiliate, or community group would be responsible for helping to identify a good spot for public stamping, securing a venue for the workshop, hosting Ashley and Renae, doing community publicity and outreach for stamping and workshop, bringing in co-sponsoring groups if you can, passing the hat at the workshop to help fund the tour, and organizing a follow-up meeting about two weeks after the event to keep local organizing going. The Alliance's Tools for Organizing page has lots of material to share with workshop participants. Other organizing material and publicity tips for mainstream and social media is available from Move to Amend. If you are interested in organizing a Move to Amend event in your community, please email stampede@movetoamend.org with your city and state in the subject.